This creamed tuna is pure comfort food. It takes about 10 to 15 minutes to fix and cook, and it makes a fantastic lunch or dinner dish. The creamy tuna mixture is fabulous over split buttered biscuits or toast points, or serve it in baked puff pastry shells. It's great spooned over rice or noodles as well. Feel free to add some diced pimientos to the dish for extra color. You might also add about 1/2 cup of cheddar cheese or some grated Parmesan. In a medium saucepan, melt the butter over medium-low heat; blend in the flour, salt, and pepper. Stir and cook for about 2 minutes, or until smooth and bubbly. Gradually stir in the milk while stirring constantly. Continue cooking, stirring constantly, until mixture thickens and begins to bubble. Add drained tuna and cooked peas. Continue heating and stirring until hot. 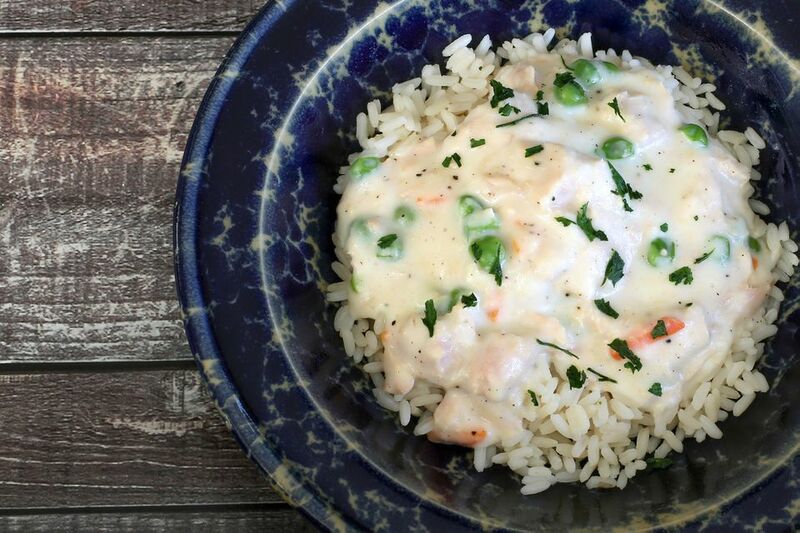 Serve creamed tuna over toast, biscuits, or rice. Heat the broiler. Arrange 6 slices of good quality white bread on a large parchment paper or foil-lined baking sheet. Melt 2 tablespoons of butter; brush over the bread slices. Sprinkle lightly with salt and pepper. Broil, butter-side up, for about 1 1/2 minutes. Flip and broil the other side for another 1 1/2 minutes, or until browned. When the toast is cool, trim the crusts and slice each slice into two triangles or two rectangles. Add about 1/2 cup of mild shredded cheddar cheese or about 1/4 cup of grated fresh Parmesan cheese to the sauce. Cook until the cheese has melted and then add the tuna. Garnish the creamed with fresh chopped parsley, chives, or some shredded or grated Parmesan cheese. Shrimp Wiggle: Instead of tuna, make this with about 1 cup of peeled and cooked salad shrimp or chopped larger shrimp. Add a few tablespoons of drained diced pimientos along with the tuna and vegetables. Add about 1/4 to 1/2 cup of sauteed sliced mushrooms or drained canned mushrooms. Instead of plain frozen peas, use peas and carrots. If you aren't a fan of peas, use frozen steamed carrots, corn, or green beans. Add 1 tablespoon of dry sherry to the sauce, if desired.